Lonnie Wheatley, TULSA, Okla. (May 4, 2017) – Thomas Kennedy is among the latest leaders in the Open Wheel Power Rankings as the likes of Donny Schatz, Justin Grant and R.J. Johnson maintain their respective top takings. Kennedy has moved atop the Rod End Supply Winged 360 Power Rankings while Schatz holds down first in STIDA Winged 410 Power Rankings, Grant leads the way in Momentum Racing Suspensions Non-Wing 410 Power Rankings and Johnson holds the lead in Beaver Stripes Non-Wing 360 Power Rankings. Also, Christopher Bell holds the top spot in www.midgetmadness.com Midget Power Rankings released earlier today while Marcus Thomas is atop the initial 2017 release of the 305 Power Rankings presented by Dodge City Raceway Park. While the lead trio of Donny Schatz, David Gravel and Brad Sweet remains the same in STIDA Winged 410 Power Rankings, the rest of the standings have shuffled up extensively with Mother Nature playing a big role over the past two weekends. Gravel has continued to cut away at Schatz’ early big advantage, whittling it down to just 88 points with Sweet another 47 points back in third. Behind the lead trio, Tim Shaffer has worked his way up to fourth with Danny Dietrich cracking the top five after collecting his third win of the year last weekend. Chad Kemenah has climbed to sixth with the balance of the top ten including Jason Johnson, Brian Brown, Sheldon Haudenschild and Daryn Pittman filling out the current top ten. Justin Grant has continued his red-hot start to the 2017 campaign by adding another pair of recent wins to extend his lead in Momentum Racing Suspensions Non-Wing 410 Power Rankings to 55 points over Chad Boespflug with Chris Windom just another nine points back in third. 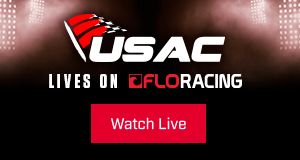 Grant added his fourth Non-Wing 410 Sprint Car win of the year in USAC action at Plymouth Speedway on Friday, April 21, before adding another win two nights later at Kickapoo Speedway in Illinois. Behind the lead trio of Grant, Boespflug and Windom, Thomas Meseraull made a jump from ninth to fourth after top-four runs at both Plymouth and Kickapoo while Jarett Andretti rounds out the current top five. Shane Cottle is sixth with the balance of the top ten including Kevin Thomas, Jr., Chase Stockon, Damion Gardner and Landon Simon. Momentum Racing Suspensions is a racing suspension company that specializes in building and rebuilding shocks for the racing industry. 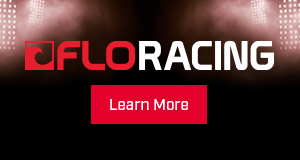 The company is owned by Brad Benic, a leader in the industry that has been around racing his entire life and in the suspension business since 1995. Momentum Racing Suspensions specializes in open wheel circle track racing, but has the ability and know how to get you the optimum performance out of any suspension on any track type or configuration. 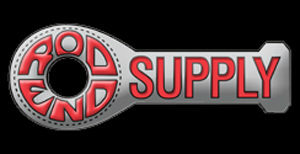 To find out more about us, call Brad at 317-842-3278, email at momentumsuspensions@yahoo.com or check us out at www.momentumracingsuspensions.com. Taking advantage of a couple of idle weekends for previous leader Sam Hafertepe, Jr., Winnipeg’s Thomas Kennedy has climbed atop the Rod End Supply Winged 360 Sprint Car Power Rankings. Kennedy added his third consecutive triumph in a row with an April 22 score at Park Jefferson after a season-opening runner-up finish in the “King of 360s” finale at East Bay to earn a slim four-point advantage over current Lucas Oil ASCS National Tour point leader Hafertepe, Jr., with Johnny Herrera just another six points back in third. Current Sprint Car Challenge Tour (California) point leader Sean Becker is just 11 points off the lead pace in fourth with Derek Hagar rounding out the current top five. Shane Golobic and Morgan Turpen have moved into the top ten in sixth and seventh, respectively, with Brian Bel, Mark Smith and A.J. Maddox rounding out the current top ten. R.J. Johnson secured his position atop the Beaver Stripes Non-Wing 360 Sprint Car Power Rankings by racing to his sixth overall win of the year Saturday night in USAC Southwest action. With the triumph, Johnson extended his advantage to 27 points over Ryan Bernal with Charles Davis, Jr., Austin Liggett and Stevie Sussex rounding out the current top five. The balance of the current top ten includes Shon Deskins, Jace Vander Weerd, Jake Swanson, Danny Faria, Jr., and Geoff Ensign. It’s a definite Texas flavor in the early going with the Lone Star state further into the season than most of the rest of the country. Corsicana’s Marcus Thomas has already racked up 11 overall top-five finishes to open up a 21-point advantage over Jeb Sessums, who has ranked first overall in season 305 Power Rankings on two previous occasions. John Ricketts gives Texas reps a sweep of the current top three with PASS contenders Zach Newlin and Tyler Reeser filling out he current top five. The state-of-the-art Dodge City Raceway Park in southwest Kansas is the presenting sponsor of the 305 Sprint Car Power Rankings. 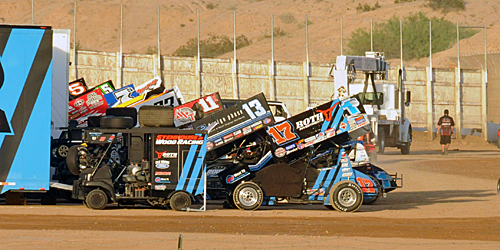 Dodge City Raceway Park hosts a variety of racing events over the course of each year including the return of the World of Outlaws in October along with a regular slate of DCRP 305 Sprint Cars. 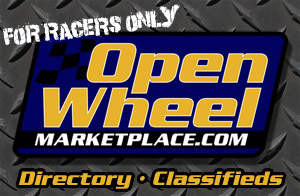 Check www.dodgecityraceway.com for the full schedule and more information. 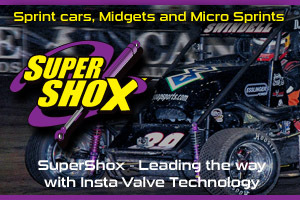 The latest www.midgetmadness.com Midget Power Rankings are available at http://www.midgetmadness.com/bell-leads-midget-power-rankings/.